Poverty is a massive, multi-faceted problem that no single organization can solve on its own. This is why GK works with all sectors and industries without judgment, harnessing the innate goodness of those who often want to give but do not know how, or have not found an organization that they can trust. Our experience has shown that there is no absence of caring and generosity in the world – people are simply looking for credible organizations. Gawad Kalinga strongly believes in the power of collaboration, and this is why it provides partners with opportunities to help. 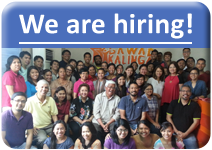 Gawad Kalinga works to unleash the potential and capacity of all individuals and organizations to participate in the great task of nation-building. Creative leveraging also allows us to multiply resources given by our partners. A dollar donated for the materials to build a house triggers a counterpart value in “sweat equity” from the beneficiaries, professional services from volunteer architects and engineers, and dedicated community organizing and program implementation by the Caretaker teams. This initial contribution also inspires many others to do their parts. We estimate that every dollar given for GK translates to four dollars delivered to the poor because of GK’s ability to leverage your contribution with other resources that are triggered once you give. With partners from the business sector, Gawad Kalinga sees Corporate Social Responsibility as a vehicle for nation building and a stimulus for economic growth. Done through the GK way of sharing and caring, CSR translates to social justice: sheltering the homeless, feeding the hungry, building productivity and creating abundance for all. Through the GK way, CSR resources are not mere dole-outs but are matched with the sweat equity of the community and the time and talents of our volunteers. For some partners, it becomes not just a matter of funding, but of sustained volunteerism usually led by their top management team. They not only give support to GK programs but also consistently champion the communities that carry their corporate branding not only at the gates but also in the grateful hearts of the residents. The new bottom line then becomes profit with a bigger social conscience.